Team Jefferson Starship reviewed this Haunted Attraction on October 19, 2018. 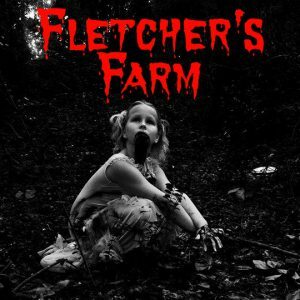 Fletchers Farm is a haunt that is growing each year, offering up scares to any and all visitors. Every year, the crew at Fletchers work to change the haunt so that each visit is slightly different from the last all while maintaining the traditional feel of a southern haunt. Every year, the popularity of the farm grows. Be prepared to spend the better part of an evening here; bring your friends and enjoy a night out at one of the growing bright spots in the area! Fletchers is packed with a lot of different scenes scattered across the back hills of the farm. These scenes are filled with all manners of gruesome and ghastly folks – morticians, cannibals, clowns, and more. Cast members do a great job of staying in character – whether it’s a loud and boisterous monster, a looming undead mechanic, or a silently mysterious clown. There’s not a lot of dialogue that gets initiated here: monsters are too busy leering, screaming, and bashing their surroundings to talk to the mere mortals passing through their grisly scenes. In fact, even when one creepy girl attempted to speak to us, another monster simply started pushing us on our way with a prop. We still managed to get in the last word as the trail looped back around and we got to see the creepy girl one more time on our way through. The Farm is pretty much an outdoor haunt; though there are some shelters built that you will wander through, most of your time is spent exposed to the elements. The costumes worn by the cast have been exposed to dirt, grime, filth, and gore. There is nary a clean spot of clothing to be seen on anyone’s body from the moment you step aboard the haunted bus until you maneuver your way past a trio of creepy, young girls in a dimly-lit maze. As always, the residents of Clown Town put a lot of care into their costumes, and some of that care is starting to spread to the other little locales at the back of the Farm. Though there’s not an easily readable sign marking the way to Fletchers, you cannot miss the brightly strung lights that mark the drive down to the parking lot at the bottom of the field. Similar lights lead you to the ticket booth and from there into the large, open-air courtyard where you wait your turn to enter. The staff is engaging, polite, and friendly – ready to help you with anything, whether it’s getting a cup of hot cocoa or addressing any (minor) issues that you might encounter. Information for Fletchers Farm is solely on Facebook this year; but every post they make lists their hours and ticket prices, so you never have to go far to find what you need. Since this is an outdoor walking trail, be sure to wear closed toed shoes. If you’ve got issues with walking, be alert and aware. You’ll be walking outdoors and into and out of structures, so be sure to watch your step in addition to watching for the next monster. The wait at Fletchers can be a long one. This haunt continually works to improve and because of that, it’s popularity has spread, bringing more and more visitors to experience the terrors beyond the walls. The front holding area that greets your arrival has a huge, two-story facade that resembles an old west street – complete with a saloon. The whole thing is lit with colored spotlights and topped by a stage where a costumed dancer performs for the waiting patrons to music blaring from unseen speakers. This huge facade and the dancer are entertaining but don’t really prepare you for the assortment of scenes and creatures waiting beyond. There are a few costumed monsters that occasionally pop through the waiting area, but most seem to be on errands and not concerned with working the crowd. However, our wait time was brief on the night we attended; when you attend you may find more of these creeping creatures stalking you during your wait. Constructed on a hilltop at the back of a farm, Fletchers does a good job of focusing your attention with the use of lighting. As you wander in the dark of night from scene to scene, faint lights guide your way, only to deliver you to a more brightly-lit facade. Each of these ushers you into a variety of different scenes filled with bangs and screams and an assortment of visuals meant to disorient or startle. A lot of the sounds are actor-driven or generated and consist of banging on walls, the revving of power tools, and other occasional bits of sounds strung through. Because of the outdoor nature of the haunt, there is some bleed over of sounds from nearby rooms and scenes, but often these serve to heighten the anticipation rather than giving anything away. Like many old-school haunts, Fletchers doesn’t have one single theme that runs throughout. Instead, you’ll be treated to a variety of different locations, each with their own cast of creatures. From a monster-inhabited bus ride to an asylum, through a collection of funerary scenes to the infamous Clown Town, there’s a lot of things going on at Fletchers. One of them is sure to scare someone in your group. When you first venture beyond the walls of the holding area, you’ll be taken back with a large group – enough to fill a school bus. However, over the course of the back half of the haunt, as you do venture through various areas, you’ll be slowly whittled down until you finally enter Clown Town in small groups of two to four. As the group size dwindles, the scares seem to steadily increase. Fletchers really knows how to play on the feelings of safety we derive from groups. The initial bus ride is largely just a lot of bangs, the confusion of the bumpy ride, loud exciting music, and a couple of costumed actors. So there’s not a lot of scares but a lot of excitement. By the time you exit Clown Town to wait for your hayride back, you’ll find you’ve been winnowed of any sense of safety and companionship. This technique also works well with the pacing of the scares – from a lot of straight-forward startles, jump scares, and loud bangs to the looming menace of the clowns, you’ll find your uneasiness grows the further along you make it. We got through the Farm a little faster this year than in previous journeys, but we don’t feel that the show was lacking (maybe we’re just getting better at mazes). There is a ton of stuff to see at the Farm once you’re done waiting up front including a haunted bus ride, the multitude of scenes along the walking trail, a calming hayride back towards the lights of the Farm, and then another maze (populated by creepy little girls who do their best to keep you guessing) before you exit back to the safety of the corral. For all of that, you pay very little. Even their fast pass pricing is competitive when you consider the amount of time you’ll spend walking the back hills of Fletchers. Fletchers Farm is not a huge, high-tech haunt, but there’s a lot of entertainment to be found here. It appears that they’ve got room to expand in future years; we expect to see more from them as time goes by!